It is in this chapter that we show what it is like to be young and homeless. 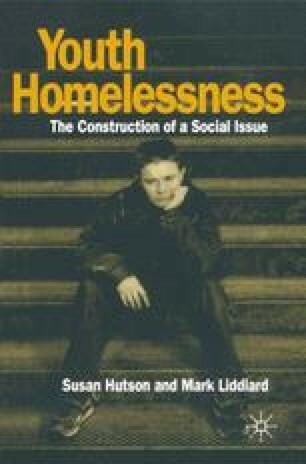 Throughout the chapter we are particularly concerned with young people’s own accounts of their homelessness. These are often used by the media and by agency workers, but are seldom considered in their own right. Moreover, young homeless people are often treated as an homogeneous group when, in reality, they have a wide range of experiences, which they express in a variety of ways. The aim of this chapter, therefore, is to illustrate the diverse experiences of young people when they are homeless.